If you like this free game, try Football World. 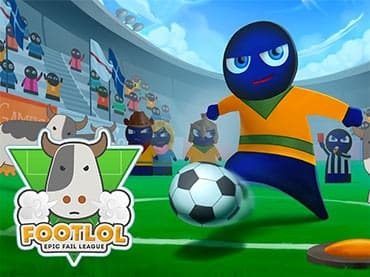 FootLOL lets you use mines, shields, UFOs, cows, glue and many more cheats to decimate the opposing team. Your opponents have often got the same tricks as you so it’s not as simple as knocking the ball in. You’ll need to beat each level’s targets– which might mean losing! Once you’ve finished FootLOL’s tournament mode, you can play against the computer or go online for gripping multiplayer! - Crazy power-ups and tools. If you have questions about FootLOL: Epic Fail League game, please contact us using this form.